The Feminine Gift had the very great honour of being given the Lumen Christi Award by Nancy at The Cloistered Heart. To say that we were humbled by this award would not be overstating matters - most especially because we respect Nancy a great deal and are continually encouraged and edified by her work at The Cloistered Heart. Thank you, Nancy! My favourite saint is St. Joseph. I could list practical reasons why. He's the patron saint of... well, everything, really, not least among which he is the Patron of Canada. The real reason is less tangible: I am drawn to his quiet strength. He feels like my spiritual father. My favourite part of the Mass is actually two parts. I like the Gloria, and I like saying, "Lord, I am not worthy that You should enter under my roof, but only say the word and my soul shall be healed." What is truer than that? Hmm... my favourite thing about being a Catholic? Aside from being the Church established by Christ, apostolic succession, the deposit of faith, etc., I really appreciate that the Catholic Church acknowledges the whole person. Every facet of being a human being is addressed and provided for, either in Her teaching, or in the lovely bells and smells wrapped up in the sacraments and the Mass. Nothing about our humanity is denied or hidden. God made us men and women, flesh and bone, and it is good! And then He provides the means to sanctify and perfect that very humanity. My favourite saint is Padre Pio. My grandmother has had a great devotion to him for as long as I can remember. She even saw him in person just before he died. When I was a teenager I began reading books about him and came to see him as a spiritual father of sorts, despite his outward gruffness. My husband and I went to Italy a few years ago, and it happened to be the 50th anniversary of the Padre's death. The Capuchin's exhumed his incorrupt body and displayed it only for one year. I was able to spend several hours with a saint whom I greatly admire and love. I haven't been the same since. My favourite part of the mass? I've never considered this question before. I'm with Tess on it though - "Lord, I am not worth that thou shouldst enter under my roof, but only say the word and my soul shall be healed." I like the new translation infinitely better than the old. And finally, my favourite thing about being Catholic? What's not to love? If pressed, I suppose I'd have to say that my absolute favourite part is Jesus. I know, I know, lots of other folks have Jesus, but they don't have JESUS. Truly present. Speaking. Living. Breathing. In the host. Every day. 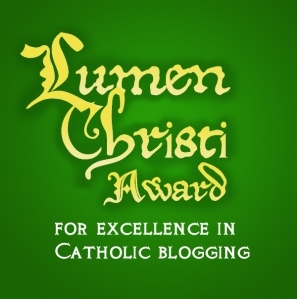 We would like to pass this award along to The Catholic Young Woman. We love this blog because they are providing " a place where young ladies can be comfortably feminine and find the encouragement to bring that femininity out into a disparaging society." The Catholic Young Woman is a beautiful blog, both in appearance, and in content. Thank you, ladies, for your presence on the world wide web!